Borjomi mineral park which is located in town on Borjomi, some 120 km from nations capital Tbilisi, is a lovely place to enjoy a lazy day, preferable for slow walking and enjoying beautiful aroma coming from pine cons. As a rule of thumb there is some small entrance fee for entering Borjomi Mineral Water park (some 0.5 GEL or 1.00 GEL), but during our hiking trip we enter this park from the other side and save up that money. So the pictures I will post bellow are from the other side of park. There are some attractions for kids available in Borjomi mineral water, like there ae a pirate ship, roller coasters and other. This probably the most famous place in Borjomi mineral water - a place were free Borjomi water comes out of the spring. Those arches are actually great for taking portraits. Compared to those ones you buy at a store, this one tastes strange, but you can use it for medical treatment instead of drinking this water. According to written on that A4 paper - it's 2GEL for a drive in park, and 4 GEL for a plateau. Lovely. Borjomi’s mineral water park occupies a narrow, wooded valley and is a lovely place to walk. 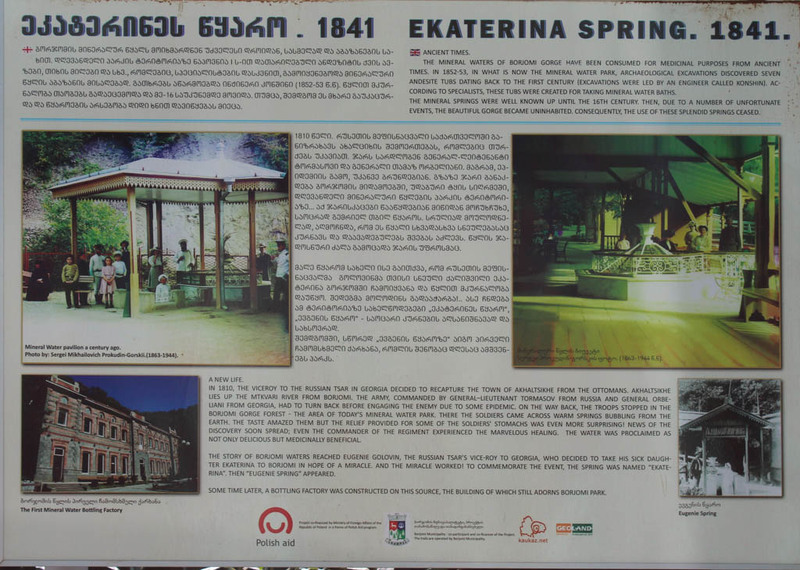 This was where the original mineral spring was discovered, and named Yekaterinsky Spring after the governor’s daughter, who was cured here. The park itself dates from 1850. To reach it, cross the little Borjomula River just east of Borjomi Park station, turn right along 9 Aprili and go 600m. Warm mineral water flows from taps in a pavilion straight in front of the entrance (you can fill bottles with it). Most of the park’s facilities – cafes, funfair attractions, a cinema and a cable car (1 GEL each way) which will carry you up to a hilltop Ferris wheel – only operate from about late June to early September. If you walk about 3km upstream through the park, you’ll find a small, natural, spring-fed swimming pool with a constant temperature of about 27°C. A second public mineral-water spring (this one cold) emerges inside a metal cage over the Borjomula River just outside the park: cross the footbridge opposite 9 Aprili 46, then go left for about 40m. The Borjomi bottling plants draw their water from other mineral springs – there are about 40 in the area.